Which activity is more feminine: embroidering a pin cushion or digging up ancient artifacts in a foreign land? The answer may surprise you. 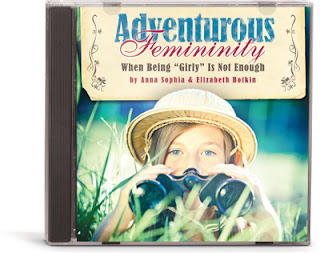 In this practical message from Anna Sophia and Elizabeth Botkin, femininity is examined in terms of how a young woman can fulfill her unique calling within her family—not by defining which adventures and activities girls “can” or “can’t” enjoy. The exhortation to young women is clear: Do not pursue a brand of femininity that is so obsessed with its own girliness that you can’t get your hands dirty with real service for Christ. Adventurous Femininity is HALF OFF today and ONLY $5! Have a blessed day raising your daughters for the Lord!